CocoaPods are an extremely popular way to publish and use third-party libraries on iOS and OS X. Let's create and publish one of our own. Our Pod will provide shortcuts to commonly used directories, like the user's documents directory as NSURLs. Let's get started. We'll be asked a few questions such as what language we want to use (Objective-C/Swift), whether we'd like to create a demo application, etc. then a complete Xcode workspace and directory structure will be created. We'll open up the newly created workspace and get started by filling out all the metadata (summary, author, etc.) about our new Pod inside the .podspec file. 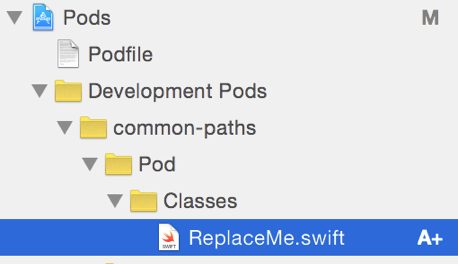 CocoaPods generated a blank .swift showing us where to put our code. We do as we're told, and replace it with a new file called NSURL+CommonPaths.swift. Here's our new common-paths Pod up on the CocoaPods website: common-paths.